Cynthia Kim Eminent Professor of Information Technology Anthony Ephremides was recently named a Distinguished University Professor at the University of Maryland. He has a joint appointment in the Clark School's Electrical and Computer Engineering Department and Institute for Systems Research. This official title is the highest academic honor that our university confers upon a faculty member. It is reserved for a small number of exceptionally distinguished scholars. Distinguished University Professors are selected from faculty who have been recognized nationally and internationally for the importance of their scholarly or creative achievements and who have demonstrated the breadth of interest characteristically encompassed by the traditional role of scholar, teacher and public servant. Ephremides has been recognized for founding the field of ad hoc wireless networks, and as a leading international scholar in communication. 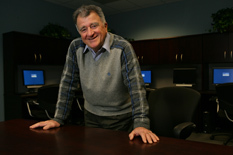 Tony Ephremides has been a leader in the Department of Electrical and Computer Engineering throughout his 41-tenure. He also holds a joint appointment with the Institute for Systems Research, of which he was a founding member. Professor Ephremides is also a member of and former Co-Director of the Maryland Hybrid Networks Center, formerly known as the Center for Hybrid and Satellite Communication Networks. He is the undisputed founder of the field of ad-hoc wireless networks, spearheading the development and evolution of this sub-field of infrastructure-less networks before many technical experts even comprehended the subject. Ephremides’ pioneering work culminated in the creation of a basis for self-organization of wireless networks in 1979. The U.S. Navy Fleet adapted his work to form the basis for seminal work in modeling, performance analysis, and understanding the operation of networks subject to mobility, fading, interference, changing connectivity, and other impairments. Ephremides remains at the forefront of breakthrough research in this field; spearheading new concepts of layerless networking and energy efficiency in wireless systems—innovations which have opened up entire new directions of research and led to development of new commercial products. Professor Ephremides is a frequent international distinguished speaker and plenary lecturer at universities and institutions. His former advisees are successful entrepreneurs or well-regarded faculty members at MIT, UCSD, the University of North Carolina and prestigious institutions abroad. He has served in many capacities in the IEEE and other organizations and has been honored with many prestigious accolades and awards. He was named to the top grade of IEEE Fellow in 1987. In 1991 he received the IEEE Donald E. Fink Prize Paper Award, a prestigious distinction covering all IEEE publications. In 1996, he was honored with the inaugural presentation of the Association of Computing Machinery’s Sigmobile Award, which selects the most distinguished contributor to the field of Mobile Communication Systems worldwide. In 2001, he was one of the first to receive the University of Maryland’s Kirwan Research Award. In 2006, Ephremides was recognized for lifetime leadership within the IEEE information Society with the presentation of the Aaron Wyner Leadership Award. He was also selected to receive the Naval Research Laboratory’s Alan Berman Award.